This FREE Trash to Treasure handout is an eight page booklet that features clever ideas, fun and engaging mini-lessons in addition to cute and easy to construct crafts made from recycled or common, everyday items. 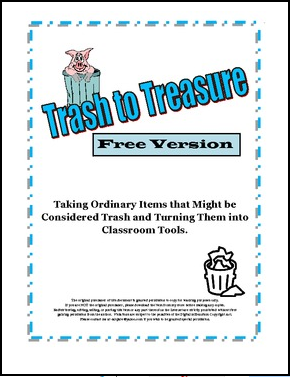 In this resource, discover how to take old, discarded materials and make them into new, useful, inexpensive products or tools for your classroom. Learn many out-of-the-ordinary ways to use milk lids for math. Did you know two plastic beverage lids can be made into card holders for kindergartners or for those whose hands are disabled? Discover how to use butter tubs to create a fun indoor recess game that practices math skills. How about practicing math facts using egg cartons? Because these numerous activities vary in difficulty and complexity, they are appropriate for most classrooms, and the visual and/or kinesthetic learners will love them.